Such was Lewis Hamilton's dominance in the Japanese Grand Prix where he led every lap that the rest of the drivers had to be content with the leftovers. 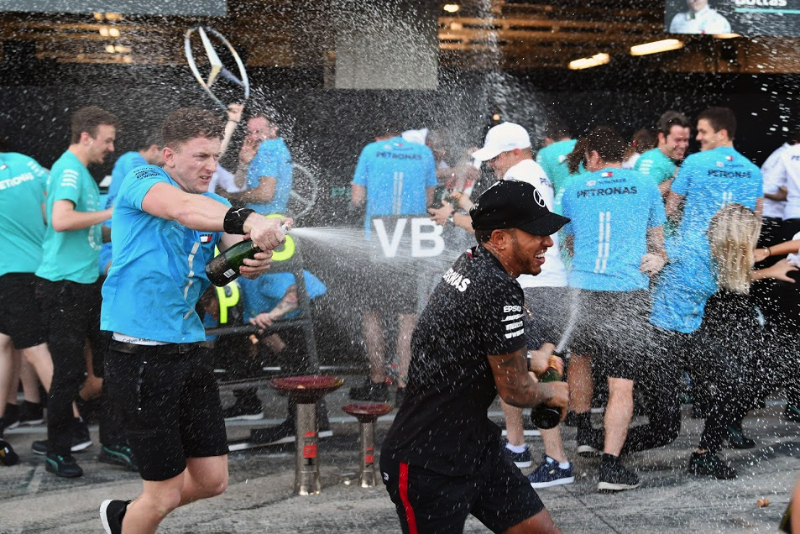 That included Sebastian Vettel who finished back in sixth, which gives Hamilton a nearly insurmountable lead in the world championship with four races remaining. Here's how it all unfolded. Hamilton started from the pole for the 80th time in his Formula 1 career. Rain was hovering when the third and final segment of qualifying began. Ferrari sent Vettel and Kimi Raikkonen out on intermediate rain tires. It was a mistake and they came in for slicks at the end of their out lap. By the time they had switched to slicks and gone back out again the rain had started. Raikkonen still managed to clock the fourth best time, but Vettel, who slid off at the Spoon corner on the slick track, would line up eighth. "We expected that there was more rain coming and obviously it didn't," Vettel said. "So then it was the wrong decision. But when the conditions are like this then obviously you either get it right or you get it wrong. I'm not blaming anybody." By going out immediately on slicks, Mercedes teammates Hamilton and Valtteri Bottas and Red Bull's Max Verstappen grabbed the top three spots on the grid. And Romain Grosjean (Haas) took fifth. Hamilton said: "The call that we made to go out for Q3, which is probably the most difficult call - you saw all of us fumbling and kind of trying to figure out what to do - the team just were spot on with it and gave us the opportunity to grab this pole position." The Renault engine in Daniel Ricciardo Red Bull had yet another glitch, and so he started down in 15th. Race day was sunny and the track temperature was much higher than it had been on Saturday. During the race weekend before, in Russia, Mercedes had not anticipated the scenario that led to the necessity of issuing team orders so that Bottas let Hamilton go ahead. The team made things clear in Japan: Hamilton would finish in front of Bottas so as to earn maximum points. When the red lights went out to start the 53-lap race Hamilton took the lead. It was all over as he would lead the rest of the way. Bottas slotted into second where he would finish 53 laps later. And Verstappen would go from third to third but have plenty of action along the way. While there would be no fight for the lead there was lots more to keep the fans entertained. Verstappen went off at the chicane at the end of lap 1 and hit Raikkonen when getting back on the track. That earned Verstappen a five second penalty. Vettel was flying. He had moved quickly up through the order, and grabbed fourth place as Verstappen and Raikkonen clashed. Debris from a collision between Charles Leclerc and Kevin Magnussen on lap 1 brought out the Safety Car, which stayed out until the end of lap 7. After sliding off at Spoon in qualifying, Vettel had another incident in the same turn in the race. He tried to dive inside Verstappen and they collided. Verstappen continued with a somewhat damaged car. Vettel, whose car was also damaged, spun and dropped all the way back to 19th place. "With Sebastian - in that corner you can't overtake. I even gave him space, but he understeered into my car," Verstappen said. "I went for the gap that was there," Vettel said, "and as soon as Max saw that I was side-by-side, he tried everything to squeeze me but didn't give me any room. So, then it was then inevitable to make contact." The stewards ruled it to be a racing incident and issued no penalties. Ricciardo was charging through the field and not hitting other cars. He would eventually finish fourth. This would be a one stop race for most drivers. Hamilton pitted for tires and kept the lead. Hamilton was worried about his engine, but there were no problems and he continued to circulate out front. Bottas got tangled in traffic which allowed Verstappen to close within a second, but that would be as close as Verstappen would get. "I knew what I had to do and I was really just executing the plan," Bottas said of finishing second. "The pace felt good. But at the end of the second stint I had some blistering, which made it a bit trickier, but anyway, for me the job was to get to the finish line in P2." With six laps remaining Raikkonen, in fourth, was 39 second ahead of Vettel. Ferrari did not issue any team orders that would have put Vettel ahead so that he could gain two points. Hamilton had the pole, led every lap and the win. But Vettel posted the fastest race lap time on the penultimate lap, and that prevented Hamilton from having a perfect race. Hamilton now has a 67-point lead over Vettel. If Hamilton can gain eight points over Vettel in the next round - the United States Grand Prix - he will clinch his fifth world title. "We've gone from strength to strength as a team this year," Hamilton said. "Austin is generally a good track for us, and I can't wait to unleash this beast there."